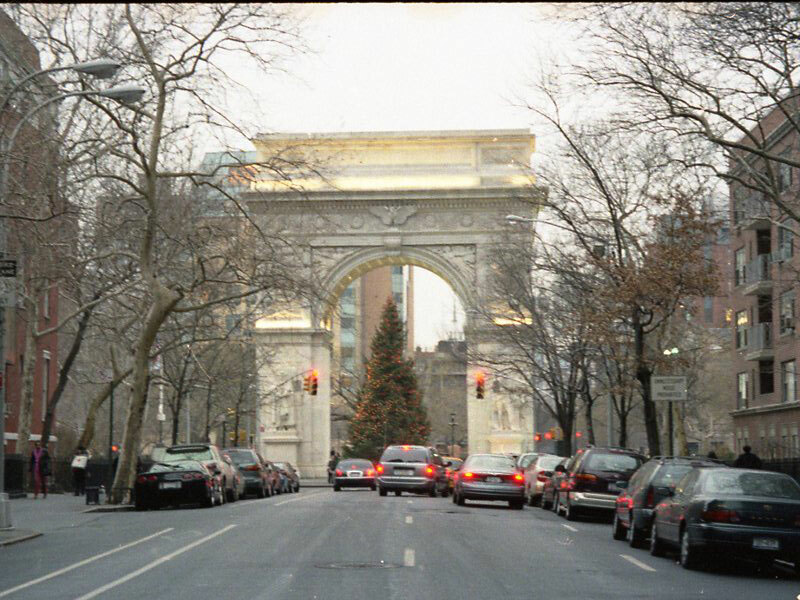 Like a portal to a timeless era, Washington Square arch is an iconic landmark of Greenwich Village. I was intrigued when I saw the trailers for the recent Coen Brothers movie Inside Llewyn Davis. The carefully composed images of Greenwich Village evoked the gritty glamor of the early 1960s in that neighborhood where poets, artists and musicians found cheap lodging and community. I was some kind of excited when, at age twelve, I went with my Girl Scout Troop on an overnight trip to New York City in the early 1960s. We toured the United Nations, saw a Broadway musical and the Statue of Liberty. But what I was really looking forward to was seeing Greenwich Village. I’d read about the beatniks. I had a set of bongos. I aspired to be cool. However, my hopes of breathing the air of Washington Square were squashed by the caution of the trip chaperones. Our tour bus did pass by the famous square, but we weren’t allowed to get out of the bus. Who knows what we might have inhaled? The frustration I felt only made me more determined to experience the city on my terms. Five years later, in the winter of 1966-67, I moved into a small apartment on the Lower East Side. Suffice it to say I learned a lot. By then the folk music scene had given way to upstart rock bands. There weren’t many bongo players around. But there were still a lot of scruffy young men wandering about with guitar cases filled with dreams. When I watched Inside Llewyn Davis I was expecting to see something of that tumultuous time when civil rights and social justice were at the forefront of public discourse. But I hadn’t taken into account that this was a Coen Brothers film. The award winning duo has made some amazing films, among them Fargo, O Brother Where Art Thou?, and No Country for Old Men. Some even consider The Big Lebowski a great film. Who am I to judge? I wanted to like Inside Llewyn Davis. It has the Village, folk music, Justin Timberlake. It even has a cat in a supporting role. But try as I might, I just couldn’t warm to any of the characters. Except the cat. The cat was cool, cooler than Llewyn, and considerably more likable. The movie follows Llewyn Davis through one week in midwinter as he attempts to restart his career as a solo performer, after his former singing partner (spoiler alert) jumped off a bridge. The movie doesn’t spell out why this happened. But after an hour or so of watching the anti-hero floundering around from couch to couch, I didn’t much care if he jumped off a bridge too. There are a lot of almost funny little scenes, slyly mocking the folkies of the early 60s, and the earnest fans who believed in them. There is a brief road trip sequence that channels the spirit of Jim Jarmusch, complete with an inscrutable drug addict and a chain-smoking Beat poet. However, though I tried to care about this story of a lost musician, in the end it was just too much like work. When the film first came out the soundtrack inspired talk of the resurgence of folk music. But really, folk music never goes away. We take it for granted, assuming it will always be there, like that person who always knows the words at the hootenanny. Like Woodie Guthrie. And now he’s gone. Who could take his place? Not someone like Llewyn Davis. Unless maybe he takes up bongos.